100% Arabica - 100% Demeter! 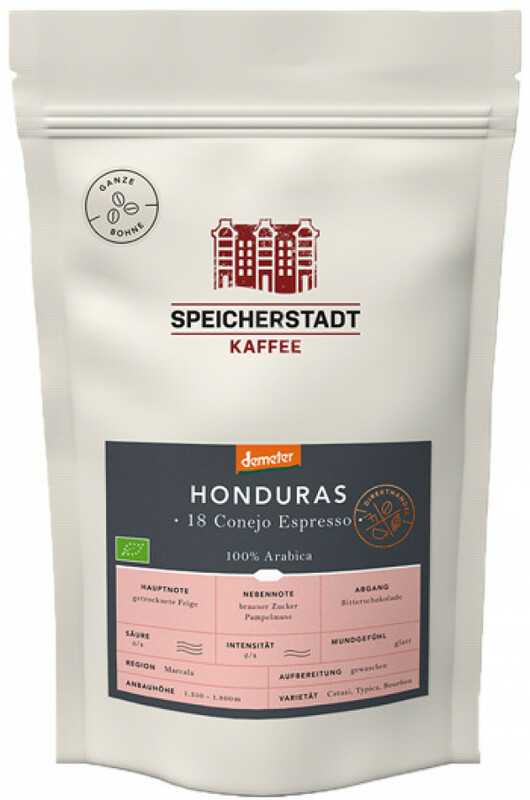 This coffee is cultivated by a biodynamically working smallholder cooperative in Marcala and imported directly from "Speicherstadt Kaffee". The centuries-old cosmological understanding of the Maya finds its counterpart in Demeter agriculture and flows into daily work. The coffee cherries are picked and processed by hand in Honduras. Then roasted and packaged in Hamburg City. By the way: The name 18 Conejo [ðjesi'ot o ko'nexo] means "18 rabbits". He describes in the Mayan calendar the term of office of the powerful king Uaxaclajuun. The cooperative named itself after him. Sugar. The espresso roast convinces with notes of dried fig and grapefruit.